Is office clutter costing you money? Office Products company Brother estimates that disorganisation costs businesses a staggering $177 billion annually in lost productivity. When employees are working in a messy environment they not only waste valuable time looking for lost papers and computer files but that wasted time leads to stress, frustration, and unhappiness, resulting in an even bigger indirect loss of productivity. Add to this the cost of printing additional copies of documents (unbelievably, the average office has 19 copies of each created document!) and ordering more office supplies to replace lost items and you start to see how the numbers stack up. 38 working hours (or close to one work week) per person each year are lost as a result of looking for misplaced items in the office at a cost of $89 billion. 66% of office workers spend up to 30 minutes of time during a typical work week looking for things they have misplaced around their office. Office supplies are on the top of office workers’ list of items lost in the last year with close to three in 10 (28%) have lost a file folder in the past year. 30% of office workers have lost out on getting reimbursed for a business or travel expense because they misplaced or lost a receipt. According to the National Association of Professional Organizations, paper clutter is the biggest problem for most businesses. The average person wastes 4.3 hours per week searching for papers while the average executive loses 1 hour of productivity per day searching for missing information. And, according to the Small Business Administration, the biggest burden for small business is the inability to properly service customers, increase sales and improve the bottom line because of mishandled paperwork. save time and improve effectiveness. Create a clean desk or clean workspace policy. Designate one hour per week for getting organised and make it part of your regular office routine. Consider handing out prizes for the best organised desk or work area. 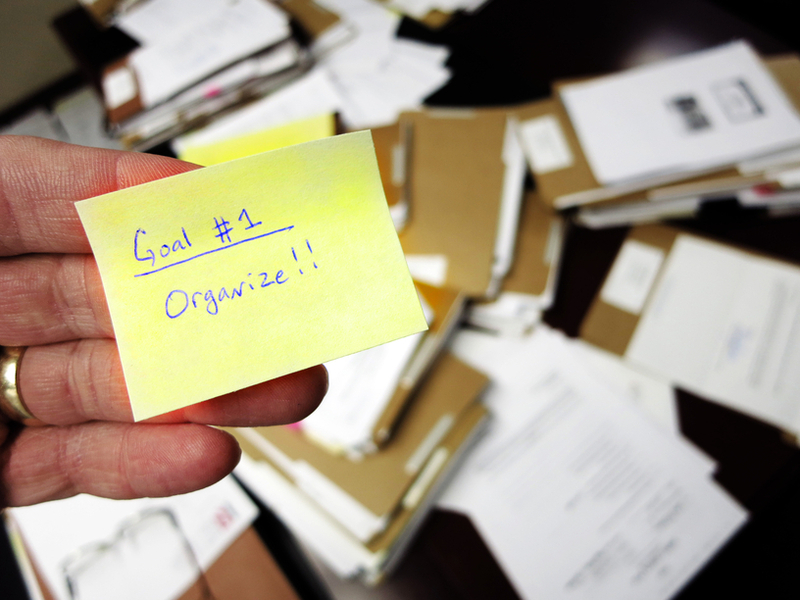 Hold an annual or semi-annual office clean-out day in which all employees participate. You could even introduce an element of fun and hand out special T shirts and prizes for the occasion! Draw up a document retention policy and archive all your documents in boxes with clear destroy-by dates for disposal when you have your annual clean-out. Remember, Away With It provide a handy same-day office clearance service so why not talk to us next time you’re planning and office clean-out day?